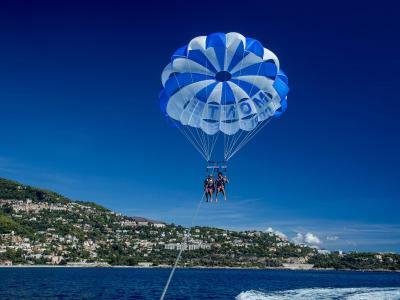 Lock in a great price for Monte-Carlo Beach – rated 9.2 by recent guests! Nice, clean and quiet place. The price is responsible to hotel delicious and space. At all it’s a amazing place. Beautiful setting. Lovely private view terrace. Comfortable bed and nice linens. Restaurant outdoor terrace very nice. Sadly one restaurant was clised for the season. Set in a spot of unique beauty, this hotel has an elegant and intimate atmosphere, but in a meanwhile it offers a fashionable beach and pool area. One-Michelin star breathtaking sea-view restaurant is another plus, as well as La Prairie spa and beauty treatments on site. excellent location, friendly and highly professional staff and lots of sun! Excellent accueil, excellent emplacement, vue imprenable, chambre magnifique avec architecture et décoration à la fois épurée, lumineuse et chaleureuse. Une impression de croisière de luxe. Salle de bain très agréable et suréquipée. Piscine olympique d'eau de mer unique, très spacieuse, chauffée. Un séjour merveilleux. Posizione incantevole, cura dei particolari, cortesia e preparazione dello staff, estrema pulizia, stanza eccezionale, vista impagabile, relax e divertimento in mare e piscina!!! Complimenti, continuate così!!! Meravigliosa la vista, la camera e la pulizia. Letto comodissimo! Tout est exceptionnel, de l’acceuil soigné au service chaque détail est remarquable. 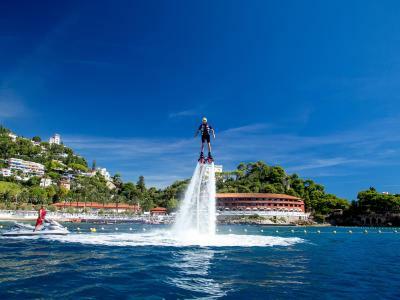 Facing the Mediterranean and offering direct access to a private beach, Monte-Carlo Beach is a luxurious 5-star hotel 1,650 feet from the border of Monaco. Guests are free to relax on the poolside terrace or in the wellness center. A private balcony with sea views features in each uniquely and elegantly decorated room and suite. There is a flat-screen TV and the private bathrooms provide free toiletries. The hotel’s 4 restaurants propose French and international cuisine in contemporary settings, and breakfast is served every morning. The hotel organizes on-site cookery classes. Babysitting services and a children’s beach club are available, and the hotel has an Olympic-size outdoor pool. The wellness center includes an indoor pool and a hammam. A limited free WiFi connection is available. 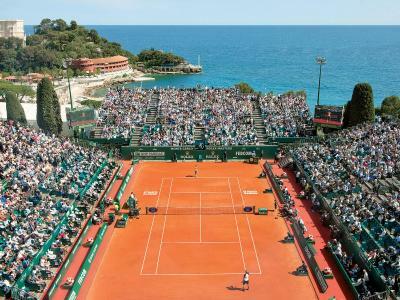 Free private parking is possible on site and the Monte Carlo Tennis Masters take place every year just 1,950 feet from the hotel. Nice is reached by car in 35 minutes. Charging stations for electric cars are available at this property. This property also has one of the top-rated locations in Roquebrune-Cap-Martin! Guests are happier about it compared to other properties in the area. When would you like to stay at Monte-Carlo Beach? With a unique décor and a private balcony providing views of the Mediterranean, this spacious room has a flat-screen TV and a minibar. This spacious and elegant suite has a Nespresso machine, a unique décor and a private balcony with panoramic views of the sea. With a unique décor, this junior suite provides a lounge, a separate bedroom with a walk-in closet, and a bathroom with a bathtub. India Mahdavi revisits a legend of the 1930s. The Monte-Carlo Beach has been entirely redesigned to offer a modern experience. The new contemporary interior design combines the spirit of the Jazz Age on the Riviera with the carefully preserved intimacy of timeless luxury. House Rules Monte-Carlo Beach takes special requests – add in the next step! Monte-Carlo Beach accepts these cards and reserves the right to temporarily hold an amount prior to arrival. There internet not that much. The room service food was the worst they taking a long time to come. Great views and right on the sea. The staff was so rude, for a 5 star hotel, the service should be atlas average, the staff should at least try to help. When staff say " you can call " " you can go look" I am a little confused as I am paying for the service.